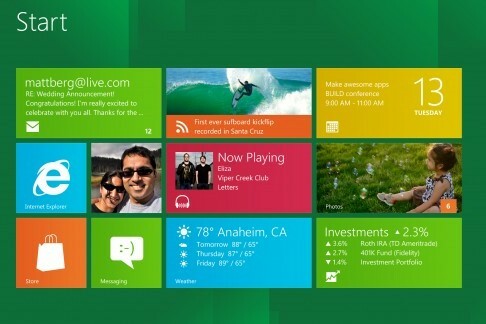 On Wednesday Microsoft (s msft) debuted its Windows 8 Consumer Preview at the Mobile World Congress event in Barcelona. The software, already available for download here, may be the most important release of Windows to date as mobile operating systems such as iOS (s AAPL) and Android (s GOOG) have gained a foothold in tablets. Although people think “desktop” when they hear Windows, there are several mobile features to be found in Windows 8 that will get Microsoft back in the tablet game. The Metro UI. 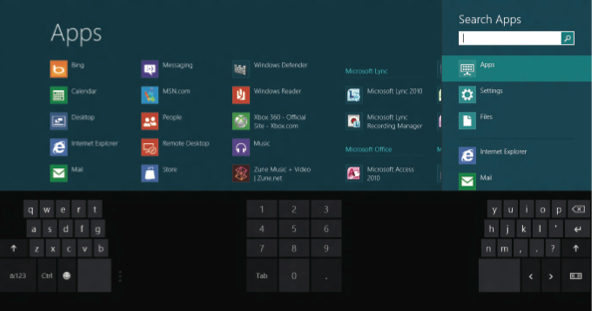 First seen in the 2010 launch of Windows Phone, the Metro UI is a relatively unique interface but takes center stage in Windows 8. Widget-like tiles that offer information at a glance are the main draw here. And tapping a tile opens up the underlying app. You could see today’s weather on a tile, for example, but with a quick tap or click, you have access to more details, such as a five-day weather forecast or the weather in other locations. 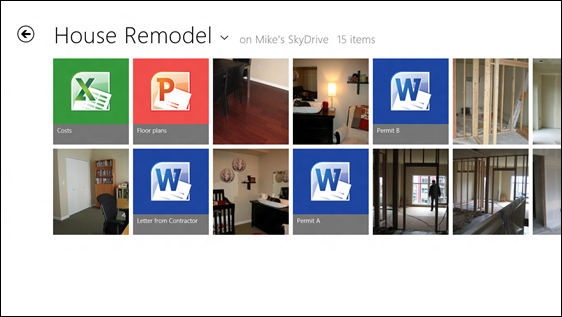 The constantly updating tiles serve as both an information provider and a simple entry point to full applications. At the same time, Microsoft is providing a very consistent interface among smartphones, tablets and personal computers, something that may help boost Windows Phone sales. A touch-friendly keyboard. It certainly helps that Windows is no longer constrained to use the resistive touchscreens of yesteryear. Capacitive displays are far easier to use, provided the underlying software is optimized to take advantage of them. To this end, Microsoft completely redid its touch keyboard for Windows 8, again emulating what we have seen in Windows Phone. That’s a good thing, as the WP keyboard is arguably one of the best, and the auto-correct features are excellent, things that will greatly help text input on a Windows 8 mobile device. The new keyboard can also split into two halves to help with thumb typing while holding a device in landscape mode. Gestures all around! Aside from not needing a physical keyboard on a Windows 8 mobile device, the mouse may be extinct too. That’s not surprising, given the use of a touchscreen, but the operating system includes smart system gestures to keep navigation effective. Sure, there is pinch-and-zoom functionality as well as the ability to rotate objects with two fingers. Swipe a screen from the bottom and you will see specific application commands while a swipe from the top can dock or close an app. Drag your finger off the left edge of the display for the most recently used apps, and a swipe from the opposite side shows system commands, the Start button and sharing options. Smarter connectivity options. Given how mobile broadband plans are often capped, it’s nice to see Microsoft take an intelligent approach to connectivity on mobile devices. I noticed at least two ways the platform does this. First, there’s a setting if you are on what Windows calls a “metered data” plan; if you are, you can limit Windows Update downloads to only take place when on Wi-Fi. Second, the network management function can automatically switch a device’s connection from 3G and 4G to Wi-Fi if it finds an available wireless network. Improved power efficiency. Part of the reason Windows has been considered less of a mobility solution is how much power it requires to run. That’s a simplified explanation, but the point holds true: Windows has long been a platform for plugged-in desktops and laptops with large batteries. So how will it work on tablets that are smaller, lighter and thinner? Quite well, apparently, for a number of reasons. For starters, Windows will now run on ARM-based silicon(s armh): the chips that power today’s smartphones and tablets for hours on end. Microsoft is also optimizing the platform so that it doesn’t drain batteries as quickly. You can still run multiple apps, for example, but — again, taking a cue from mobile device advancements — background apps are suspended so that they are not using up a device’s resources. SkyDrive saves your data. No truly mobile device relies solely on local storage; it also offers cloud connectivity and remote storage. That’s where Microsoft’s SkyDrive comes in, although you can always use Windows 8 with Dropbox, Amazon’s Cloud Drive(s amzn) or any other cloud-storage system. The advantage to SkyDrive is its integration into Windows 8 and Windows Phone, similar to Apple’s iCloud in OS X and iOS. Saving documents, photos or other personal data to a SkyDrive account makes it all available on other devices through the Web or, in the case of Windows Phone, directly within a mobile platform. And Microsoft says that all Windows 8 apps have the potential to take advantage of SkyDrive storage. These are just a few of the mobility functions that will help Microsoft’s Windows 8 better compete in the mobile game. Although my experience with the new platform is very limited, I think Microsoft has made great strides. And it started when Windows Mobile was ditched in favor of the new Windows Phone platform, a total rewrite of the company’s mobile platform. It’s clear to me that Microsoft finally has an integrated strategy to implement across desktops, laptops, tablets and smartphones, not to mention Xbox Live, which now uses the same Metro user interface. There is no guarantee that Microsoft can stop the iPad’s momentum; however, the right pieces are in place to be a contender. Installed the Consumer Preview on my Lenovo ThinkPad X200 Tablet PC. My thoughts? Stupid, stupid, stupid Microsoft. work, rendering the X200’s entire Tablet PC functionality useless. This OS may look good on a slate but it’s not for laptops. For me, this is a massive FAIL. ItÂ´s too late. to compete..it will be better os probably but , Â¿with Android ?.Â¿a closed system? More competition with ios thing, that i doubt because they have their legion of unconditional fans, It will depend on the adoption. by big hardware manufacturers, like Samsung, Asus.. etc, thing that i doubt too. (Hp probably but, is loosing markets), sorry too late. It’s been taking a while, but glad to see MSFT pulling it all together. I saw Windows 8 and had many of the same thoughts. I don’t think it will outperform iOS, but it doesn’t have to. It only needs to outperform Android in the long run and I think it will. This system is made to directly compete with Apple, not Google. Moving to a simplistic design with less user control is meant to be appealing to the IOS user base. Android is all about giving users maximum control and customization. The exact opposite of what Apple and now Microsoft are offering. Interesting. Played with a LUMIA 800 last night and thought-“hey it’s very pretty” but owner had not *used* the phone and this surprised me. It’s one thing to accumulate the parts for a great multi-device experience and another to fuse them neatly. Never the less, this is exciting. I see Windows as becoming a more direct competitor to Apple than Android. It’s still closed system vs. open system and the allure of “free” is no small contender as it stands next to 800 USD devices. At least Chrome can share tabs/data in one direction. I was expecting to see a list of features that Win8 would have over other mobile OSes, but this is just a list of mobile features already implemented elsewhere which have been added to Windows. Where’s the competitive advantage? 2. Storage Spaces (basically software controlled RAID with easy management). 3. Apps which can run side-by-side. 4. Apps which can run in the legacy desktop mode as windowed apps. 5. Mega fast boot – it really is seriously fast! Storage spaces – Nice to be able to raid different sized drives in windows now, but really how many average users will be doing that. Side-by-side apps is a step in the wrong direction to me. I like being able to control the location and size of windows on my screen and rarely if ever do I have just 1 or 2 full screen apps shared on a screen. Also this feature is only available on screens with resolution greater than 1366×768 eliminating it from many tabletsâ€¦ which in my opinion seems the only place it may be useful. Legacy mode is standard mode. MS makes its money from corporations, office workers almost always have multiple monitors setup, with multiple windows open, moving away from this to focus on full screen apps is a major setback. Company’s already avoid upgrading OSes if at all possible, this will exacerbate that that. Faster boot times are always nice, but functionality is more important. After seeing the presentation from Madrid today i’d say this much,this is a serious shift in the way we use our pc’s. Yes the function/end point maybe the same, but how it gets done has now come to the fore. iPad 3 will sell loads, as many Apple devotees seek to upgrade to the latest. After the release of Windows 8, do we really think the world of computing/mobile tech will be the same, i doubt it. I can see this move by MSFT placing an unmentioned pressure on Apple. Lets just wait and see. They will stop Android though to a great deal, especially for tablets that are bigger than 7″ (non pocketable / productivity size). Android wasn’t big there and MS is going to grab that from them from day one. As for Apple, I think that MS has the potential to get even there with them eventually for the 7+”.